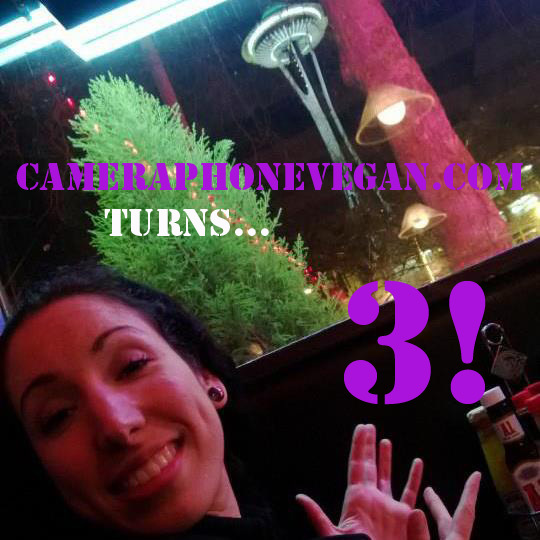 cameraphonevegan.com turns 3… in Seattle! The blog has grown exponentially too, and I’m so grateful for my new and loyal readers! The first year’s total hit count was 4,601, and this year there were 4,355 hits in January… alone! So thank you for reading and commenting and sharing even through the lulls and craziness that these big life changes bring. I was able to participate in my first VeganMoFo this past October even whilst simultaneously packing up the apartment for Seattle. It was a wonderful experience, and I’ll definitely be doing it again this fall. 4 days after arriving in Seattle I got to attend the Vida Vegan Con Tech Seminar at the Seattle Public Library, where I happily met some of my favorite Seattle vegans and the VVC girls in person for the very first time. Have a great weekend and a fun and safe St. Patrick’s Day!! I haven’t been reading your blog very long, is that you in the photo (with the “3”)? Well, Happpy Anniversary, Gypsy! Your Spaniard heritage well represented, I see.